Top quality one half inch horizontal aluminum window covering for commercial applications. The Bali S4000 provides state of the are performance in micro blinds. Utilizing an advanced headrail system, the S4000 offers a number of refinements. A light blocking lip at lower rear of headrail works in conjunction with the top slat to reduce light leakage when slats are closed. Top loading hidden brackets that position the blind closer to the mounting surface and a curved headrail face similar to a slat that eliminates the need for a valance, allows a cleaner installation for improved aesthetics. Optional box brackets with a curved face are available in key colors. Lift cord rollers for easier lifting and lowering and clutch wand tilter are also standard features. The S4000 also provides a small profile bottomrail. • Headrail: Measures 1" high by 1-1/2" deep. Headrail design to include rolled edges at top, light blocking lip at the lower back side and a curved headrail face similar to the crown of a 1" slat. Headrail is phosphate-treated steel and is finished with a vinyl primer and topcoat of polyester-baked enamel and shall measure 0.025" thick. Tilter: Is a worm and gear design in a fully enclosed housing. Design incorporates a clutch mechanism to eliminate damage due to over tilting. Tilt Wand: Solid, transparent with a hexagonal cross section .250" across points. Cord Lock: Is a snap-in design with stainless steel wear guard and a floating locking pin and is crash proof. Drums & Cradles: Are low friction thermoplastic with smooth hole edges to position ladders. Installation Brackets: Snap-in hidden brackets are made of zinc plated steel. Brackets allow adequate space to accommodate power screwdriver for mounting. The brackets facilitate easy installation and removal of headrail channel. 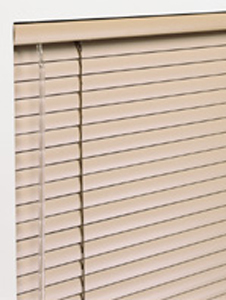 Additional brackets are supplied for blinds over 60". Optional steel and support box brackets are available in a limited color offering. Ladders (slat supports): Braided ladder with adequate overlap of slats; standard spacing is 21.5 mm, optional 20 mm and 22.5 spacing is also available. Slats: Made of USA manufactured cold rolled aluminum alloy. Slats are nominally 1/2" wide and available in standard 0.006" thickness. Slats are finished with a polyester-baked enamel with a durable antistatic, antimicrobial paint finish. Bottomrail: Enclosed tubular shade, .025" thick phosphate treated steel with prime coat of vinyl primer and finish coat of polyester baked enamel matching headrail and coordinating slat color. Bottomrail shall be roll-formed with locking grove to receive dust cover. Click here for printable pdf file.